The 2014 Hawaii general election is just two weeks away. Let’s take some time to reflect on all of the decisions we are being asked to make. We are being asked to vote on five amendments to the Hawaii State Constitution. One of the proposed amendments, early childhood education, is getting most of the attention. Here are the five proposed Hawaii constitutional amendments, and some points to consider. A constitutional amendment is a serious thing. I urge everyone to ask questions – and look for answers. Can we afford it? Posting a list of names or issuing a press release adds minimal costs. Will it solve a problem? Releasing the names of nominees offers the chance for public and peer testimony. Are there valid reasons why the nominees should not be disclosed? Can we afford it? How would this affect Hawaii’s bond rating? What are the qualifications for receiving a loan? Will it solve a problem? Would loan money help small farmers expand their operations? Would this help with Hawaii’s food security? Would we be able to increase local food production? Can we afford it? We would need to pay judges’ salaries anyway, regardless of age, but salaries may be higher for more experienced judges. Will it solve a problem? Is there a lack of qualified state justices and judges under age 60? With a term of 10 years, how can we be assured that judges over age 70 retain their competency? Will it solve a problem? There are three critical questions to answer: 1. Are 4-year olds ready (mentally and emotionally) for structured school? 2. Is school more beneficial to 4-year olds than spending time with parents and primary caregivers, or spending time in free play? and 3. Is it government’s responsibility to educate 4-year old children? Note: As of 2014, Kindergarten is mandatory for 5-year olds in Hawaii. Can we afford it? How will this affect Hawaii’s bond rating? What are the dangers to the public if the dams and reservoirs are not maintained? Will it solve a problem? Has there been a study of residents and businesses potentially in a flood zone if dams and reservoirs fail? What are the “important water sources” and how does the public benefit? Do you feel strongly on any of these issues? How will you vote? This year on October 25, join volunteers across the country for Make a Difference Day, a national day of community service. Decide what’s important to you and share your passion with others, whether you volunteer on your own, with your family, or as a team. * During the fourth week in October, join a road-side rally in front of schools to celebrate Make a Difference for Animals Week. In 2013, 24 schools, clubs, and organizations held signs and waved to support animals. * On October 25, 8 am to noon at Kalaheo High School, join students, parents, alumni, and community members to clean up and beautify the campus. * On October 25, 9 am to noon at Hakipu’u Stream in Kaneohe, join Hui o Ko’laupoko for a community workday. There is an easy 15-minute hike into the valley; there are no restrooms at the work site. Please RSVP and ask for meeting location. * On Saturday, October 25, 8:30 am to 12:30 pm at Kapolei High School, join E Ola Pono Ma Kapolei for a community work day. * On Saturday, October 25, 10 am to 1 pm at the Kaka’ako Waterfront Park in Honolulu, join Hunger Free Kaka’ako and feed the homeless families. * On Saturday, October 25, at the Assistance League Hawaii Thrift Shop in Honolulu, donate a new book to their Children’s Book Drive and help promote literacy in Hawaii. * On Saturday, October 25, 8:30 to 11:30 am at the Waimea Parker Ranch Old Cattle Pen YMCA Park and Rotary Pavilion in Kamuela, help to cleanup and beautify the grounds and re-start the youth soccer field. * On Saturday, October 25, 8:30 am to noon at Waikapu Cemetary, join the West Maui Mountains Watershed and Malama Maui Nui to clean the cemetery, clear away the brush, and haul away rubbish. Please RSVP to volunteer@cwdhawaii.org or outreach@westmauiwatershed.org. * On Saturday, October 25, 7:30 am to noon at the Main Pavilion at Lydgate Park in Lihue, join the Friends of Kamalani and Lydgate Park to clean up the park. On this workday, please bring a water bottle, work gloves, sun protection, and shoes. * On Saturday, October 25, 8 am to 12:30 pm at the Kauai Humane Society in Lihue, help fill the Gomez Galley’s Pet Food Bank. If you’re looking for year-round volunteer opportunities, the Aloha United Way’s “Get Connected Hawaii” website lets you find something that matches your interests. If there are no opportunities nearby that match your interests, you can become an ambassador for your passion. You can reach out to community organizations or schools with your idea, or plan your own neighborhood event. There is a helpful “Make a Difference Day Youth Toolkit” to help everyone find their passion and make a difference in their community. October is for the dogs. This month, the American Humane Society is celebrating Adopt-a-Dog Month and the ASPCA is promoting Adopt a Shelter Dog Month. In Hawaii, the Hawaiian Humane Society is celebrating Love a Dog Month and Make a Difference for Animals Week. On Oahu alone, there are over 300 animals being sheltered at the Humane Society on any given day and they need loving homes. Remember to choose the dog – or pet – that’s right for you, your lifestyle, and your budget. * If it smells good, I’ll stare at you with sad puppy eyes. * If it falls on the floor, I’ll eat it. * If the car window is open, I’ll stick my head out. * If the door is open, I’ll run for it. * If there’s a stranger, I’ll bark, bark, bark. 1. When I stare at you, you must blink. 2. When I am hungry, you must feed me. 3. When I am sleeping, you must go away. 4. When I ignore you, you must beg for my attention. 5. When I want it, you must give it to me. * I may look cute, but I have the heart of a warrior! * I may look cuddly, but I want to rule the world. * I know you think my feathers are beautiful. * My tank is too small. * Stop shining a light in my eyes when I am sleeping. * Keep the cat away from me! * We are running complex experiments on you. Do you have a pet now – or want to adopt one? How are pets a part of your family? The Force will once again come to Hawaii libraries and bookstores. 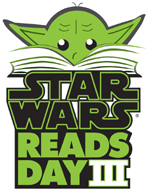 The third annual Star Wars Reads Day, a celebration of reading and Star Wars, will be celebrated on October 11, 2014. The event is sponsored by Lucasfilm, along with publishers Abrams, Chronicle Books, Dark Horse, Del Rey, Disney Book Group, DK Publishing, Klutz, Quirk Books, Random House Audio, Scholastic, and Workman Publishing. * Visit a public library: From 10 am to 5 pm, Aina Haina and Waikiki-Kapahulu Public Libraries on Oahu will host kids activities and give-aways. If you’re at the Aiea Public Library between 2 pm and 4 pm, you may even see Pacific Outpost 501st Legion troopers! Contact individual libraries for details. * Sit back at storytime: Barnes and Noble at Ala Moana Center will host a special Children’s Storytime with giveaways and activities at 11 am. * Download free Star Wars activities for kids: This free printable activity kit from StarWars.com is full of crafts, drawing and coloring pages, and games and puzzles. * Read a Star Wars book: From easy reading books for children and graphic novels to comic books and full-length novels, there’s a Star Wars story for you! * Host a Star Wars movie night: Return to the Star Wars galaxy by watching the movies. Party Ideas by a Pro has fantastic Star Wars birthday ideas that you can adapt for movie night. Snack on Han burgers, Vader taters, Wookie cookes, and Death Star cake pops, Yoda soda and Jedi juice. * Play Star Wars-inspired games: Check out TipJunkie.com for Star Wars-inspired games inspired by Star Wars, like a Jedi Training Course, Pin the Saber on Yoda, and Gungan Water Balloon Fight. Did you know that since 1977, there have been over 200 Star Wars novels and over 900 Star Wars comic books? With Star Wars Episode VII in production and tentatively scheduled for release in December 2015, we’re assured many more books in the Star Wars galaxy, filled with epic battles, friendships, betrayals, revelations, and romances. Enjoy Star Wars Reads Day and may the Force be with you! “Alas, poor stormtrooper, I knew ye not. This is one of my favorite scenes and illustrations from “Willliam Shakespeare’s Star Wars: Verily, a New Hope” (2013) by Ian Doescher, in which Luke Skywalker holds up a stormtrooper helmet and reflects on the death of an enemy soldier. It reveals Luke’s regret and sorrow at some of the violent things he has had to do to fight for freedom, which is glossed over in the movie. 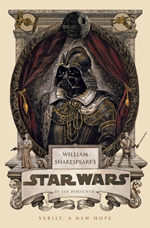 Inspired by the work of George Lucas and William Shakespeare, “William Shakespeare’s Star Wars: Verily, a New Hope” is a retelling of the movie “Star Wars: A New Hope” in five acts, in iambic pentameter, with line art illustrations by Nicholas Delort. It’s clever, fun, and fantastical, blending Star Wars’ action and drama with an appreciation for poetry and humor. Read the words aloud. Savor the rhythm and cadence of the words. Listen to Darth Vader’s deep voice, Han Solo’s wry depreciation, Luke Skywalker’s earnestness. I hope this will tempt you to read more. Can you recite lines from the Star Wars movies? Do you argue about characters and events, or debate the merits of the movies vs. the novels? Do you play with Star Wars action figures or have a realistic lightsaber? May you enjoy Star Wars fandom, my reader. You are currently browsing the Better Hawaii weblog archives for October 2014.